Three brothers, David, Edwin and Wesley Ingle were grocers in Dayton, Ohio at the start of the twentieth century. They were familiar with the usage of tokens in business. They developed unique tokens and a system for their use which they initially test marketed in Dayton and later distributed nationwide. Ingle System tokens were issued between 1909 and 1919, personalized for hundreds of businesses. The Ingle System is a method of bookkeeping which allows merchants to treat customers' credit purchases the same as cash transactions. 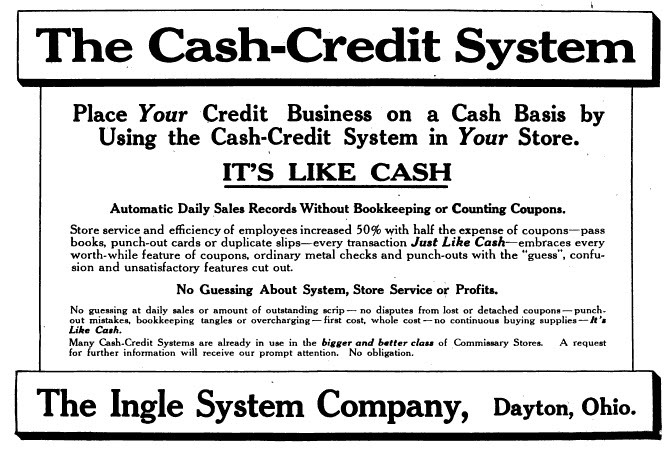 Prior to this system, businesses required credit ledgers listing each item and its price for credit purchases. Ingle provided an alternative system to this time consuming bookkeeping process, where a certain amount of credit was extended by providing the debtor with tokens in the amount of credit extended. The tokens could be spent the same as cash with the issuing merchant. The merchant's ledgers now only had to include an amount rather than a long list of items and prices. It is estimated that 75% of all Ingle System tokens were used by general stores, grocers and meat markets. Coal and lumber companies likely accounted for about 5% of use, and used the tokens to pay their employees, thus ensuring their loyalty to the "company store." Another important part of the Ingles' system was using a patented design for tokens to prevent the manufacture of counterfeits. There were two base designs for the tokens, one with a patent date of June 1909 and the later one with a patent date of April 7, 1914. The tokens come in denominations of 1¢, 5¢, 10¢, 25¢, 50¢, $1, $5 and $10. The tokens appear to have been made in copper, nickel, brass and nickel plated varieties. Based in Dayton, The Ingle Company was succeeded by the Insurance Credit System in 1919, which became part of The Osborne Register Company (ORCO) of Cincinnati in 1925. 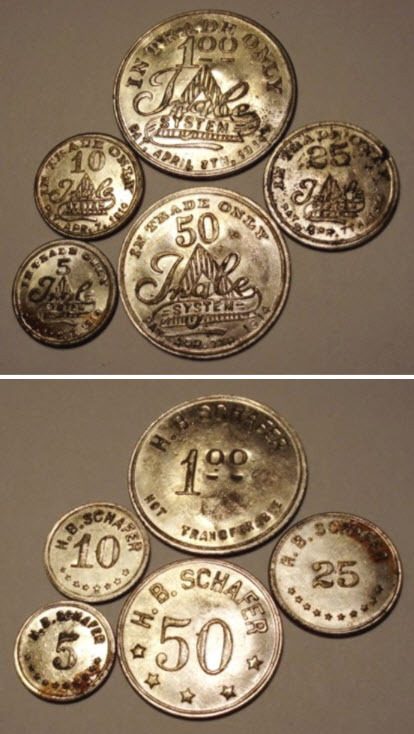 ORCO also issued numerous tokens. In that same year, Edwin Ingle and Jerry Schierloh formed the The short-lived Ingle-Schierloh Company which also issued tokens, many with the "Master Metal" slogan. Ingle-Schierloh was taken over by The Dayton Stencil Company in 1927. There are several resources for known Ingle tokens. Richard's Token Database, tokencatalog.com and there is a book, Ingle System Scrip by Lloyd Wagaman (1987). Fortunately copies of the Ingle Company ledgers and shipping records starting about 1910 have survived, and much information has been gleaned from them as to what tokens were issued and for whom. Much of this information has been contributed to Richard's Token Database. Ingle System token from C.F. White of Camden, Ohio. Ingle System tokens from H.B. Schafer of Wheeling, West Virginia, offered in an online auction in November 2015.